Next time your love life is in a drought, turn to Tinder. Or Match. Or Craigslist. Well, maybe not Craigslist. Whatever you do, just don’t try to kiss a falcon (or in this case, a small falcon called a kestrel). No matter how cute and lovable and “really into you” it looks, as one Florida man found out, it might just rip your lip off. Although the man’s name has yet to be released, executive director of Suncoast Animal League (a Palm Harbor-based animal rescue organization), Rick Chaboudy, said that the Floridian that found the bird had the best of intentions. “The bird sat there and acted tame, and he’s like, ‘Well, it really likes me,’” Chaboudy said. The man was proud of his new “pet” and decided to post pictures on Facebook (at least it’s better than an album of baby photos). 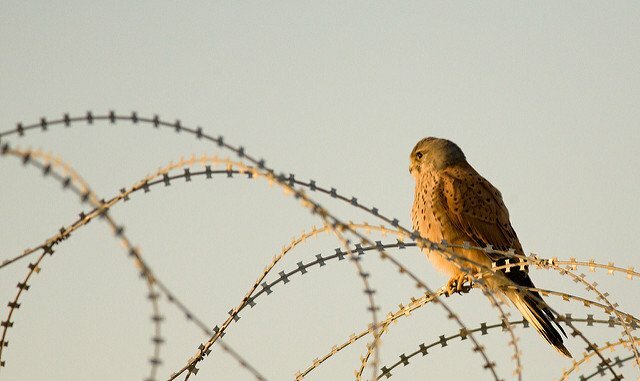 Little did he know, the kestrel is a protected species in Florida and is illegal to keep without a special permit. Someone then realized the designation and contacted the Suncoast Animal League. When a volunteer arrived to collect the bird of prey, a bloody chunk of lip was missing. Friends close to the bird did confirm that the feeling was mutual, yet overwhelming. It’s unclear whether the man pursed his lips or tried using tongue and then quickly backed off only to find out it was too late. This comes approximately nine months after another Florida man was bit on the lip by a cottonmouth and many years after the overall population realized Florida is a gold mine of utter absurdity. According to Chaboudy, the bird was probably in a daze from flying into a window or another possible head injury, which allowed him to act docile and approachable. Chaboudy says that when people try to help, it can actually hurt. “The best thing to do… is keep them [in the] dark and quiet and then find a [wildlife] rehabber,” said Chaboudy. “Dark” and “quiet”: two words that will guide this man’s future dating life.